COLD AND WET: We have patches of mostly light rain on radar across Alabama this afternoon; otherwise the sky is cloudy with temperatures in the 40s over the northern half of the state. But, way down south, Mobile and Dothan are enjoying some sunshine with temperatures near 60 degrees. A complex storm system to the west, loaded with moisture, will set up a very wet weekend for our state. Rain becomes widespread tonight and Saturday statewide. 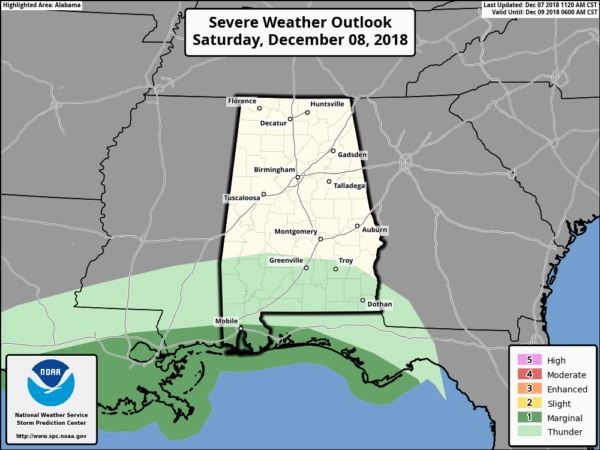 It will be cold rain for the northern two-thirds of the state, with temperatures in the 40s, but a few thunderstorms are possible near the Gulf Coast, where the Storm Prediction Center has a marginal risk (level 1 of 5) defined. Sunday will be another cloudy, cold day with light rain and drizzle continuing. 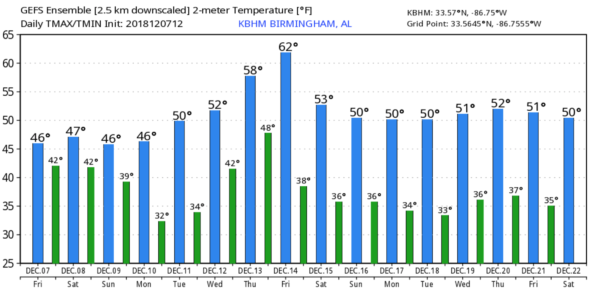 Colder air will slip into the state, and many places north of Birmingham could very well hold in the 30s all day. Rain amounts over the weekend will be in the 2- to 5-inch range statewide, and the National Weather Service in Mobile has issued a flash flood watch for Mobile, Baldwin, Escambia and Covington counties. Some flooding issues are possible in other parts of the state as well; the Weather Prediction Center has put the southern two-thirds of the state in a slight risk (level 2 of 5) for flooding on Saturday. SUNDAY NIGHT/MONDAY MORNING: We will watch thermal values closely, but it still looks like just a chance of light rain or drizzle for most of the state. The possible exceptions are far north Alabama, where a touch of light snow is possible, and far east Alabama (counties like Cherokee, Cleburne and Randolph), where cold-air damming setting in from the east could bring temperatures down to a level close to the freezing mark, opening the door for some light freezing rain. For now no impact is expected in either area if this light wintry precipitation develops. But, as always, keep an eye on the forecast over the weekend for potential changes. REST OF NEXT WEEK: The weather will be brighter Tuesday and Wednesday with a warming trend. We will bring back a chance of showers Thursday, followed by a round of rain and thunderstorms on Friday with a dynamic weather system rolling through. For now it looks like the air will be too stable for severe storms at the end of next week, but that is a week away and things could change.